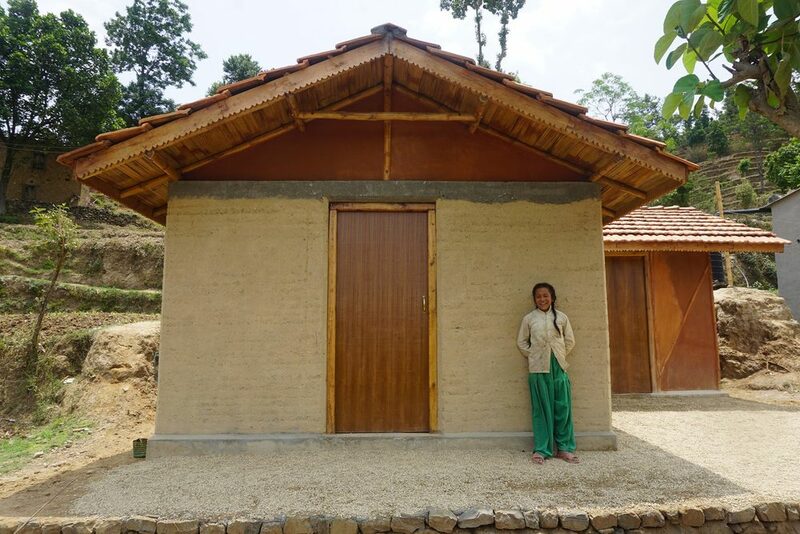 ABARI completes its first post-earthquake permanent house in Bhattedanda for Sanu Maya Tamang, who lost her home on April 25, 2015 like thousand others in Nepal to the disastrous April 25, 2015 earthquake. A single mother and humble farmer, Sanu Maya was chosen by the community as one of the families most in need. She has a 13 year old special child, Muna and 11 year old Bijay. Today, Sanu Maya and her children feel safest when inside their new home. And she really is! Built using 100% locally sourced materials—bamboo and earth—Sanu Maya’s house is the best example of sustainable reconstruction in post earthquake Nepal. Designed and conceptualised by ABARI, a design and architectural firm established in 2006, their first permanent house in post-earthquake scenario follows permaculture principles. It is a solar passive (harnesses sun's energy to maintain constant temperature throughout the year) house with rain water harvesting, self-sufficient power supply through PV cells, biogas, improved cooking stove and an organic kitchen garden. Kavre region of Nepal has the highest concentrations of earthen (adobe) buildings in Nepal. Despite being aware of the nature of damage that can be caused in such buildings during an earthquake, the locals continue to use it without improvising and applying any earthquake resistant features like horizontal/vertical ties to hold the building as a single unit rather than four separate walls. In order to inform people about ways of making such structures stronger, ABARI designed and built the structure using earth but applying modern engineering techniques to ensure safety and to make it earthquake resistant. The main features of the house are the bamboo roof and gable ends which are extremely light yet strong. The house design keeps the traditional vernacular architecture alive while creating a very healthy thermal comfort level. Sanu Maya’s home now boasts of a picturesque view and an additional room which she may consider renting out to tourists willing to experience a Himalayan homestay. The idea behind constructing this beautiful, serene yet versatile house was to showcase ways of building a dignified house with modern facilities for locals and tourists without compromising on the local tradition and environment. Retaining the inherent character of the region which the house is a part of, explains Pranathi, the project architect. The cost of construction of this house was almost 30% less than a conventional home. As per calculations done internally by the implementing team, it was revealed that about 85% of the money spent stayed within the community during the whole process of construction, as it was built using permaculture wherein the neighbors help each other in rebuilding by bartering labor. Through the construction of Sanu Maya’s house also a demonstration home, ABARI got an opportunity to train more than 50 students and neighbors to apply modern techniques while building vernacular structures. Those who received training are now willing to rebuild their homes the same way. “If the government provides us them NPR 2,00,000 (USD 2000) grant, I would like to build my house in a similar fashion as I can have a modern home but also can generate income by renting it to tourists” said Raju Lama, Sanu Maya’s neighbor. The Government of Nepal had announced to provide NPR 2, 00,000 (USD 2000) for each earthquake victim whose house was completely destroyed by the massive earthquake. To further equip the house with more permaculture features such as improved cooking stove, bio gas, rain water harvesting, PV panels for electricity and an organic kitchen garden, ABARI is now partnering with Kamala Foundation established in 2005 and is hoping that the government would use this design for sustainable reconstruction in post-earthquake Nepal.